From Tamashii Nations. NXEDGE Style goes all out with the Unicorn Gundam (Destroy Mode), further indicating the eye-catching red psycho frame with clear parts. This 4' tall figure makes up for its size with extreme detail. Beyond the psychoframe, each edge and angle is emphasized in true NXEGDE 'style.' 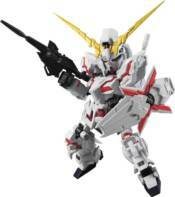 The Unicorn Gundam (Destroy Mode) set includes a beam magnum, 2 beam sabers, shield, and special display stand.